No one ever told you that your jaw could help you perform better. That’s because no one knew. Hundreds of years ago, a few people were on to something: Ancient Greek athletes who bit down on leather straps for an edge during competition; Viking and Roman warriors who clamped down on leather bits for focus on the battleeld. They knew something here worked, but the concept itself never evolved. Until now. Increases Strength – With improved airow and less stress from clenching, UA Performance Mouthwear has been proven to increase strength by an average of 17% with the UA Performance Mouthpiece and 12% with the UA Performance Mouthguard. Increases Endurance – UA Performance Mouthwear enlarges airway openings, resulting in 25% less lactic acid build-up after 30 minutes of intense exercise. Speeds Up Reaction Time – Athletes may respond faster when wearing UA Performance Mouthwear. Clinical trials show an improvement in responding to auditory cues and potential improvement in response to visual cues. Reduces Athletic Stress – Excess cortisol causes stress, fatigue and distraction. UA Performance Mouthwear decreases cortisol production, which means you feel & play better. Reduces Impact – When the jaw suffers an impact, energy can be transmitted to the head, which can cause concussion. 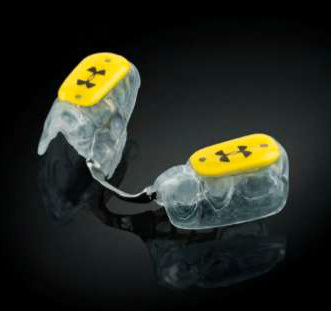 UA Performance Mouthguards have been shown to reduce the G-Force impact of blows to the jaw by up to 20%.